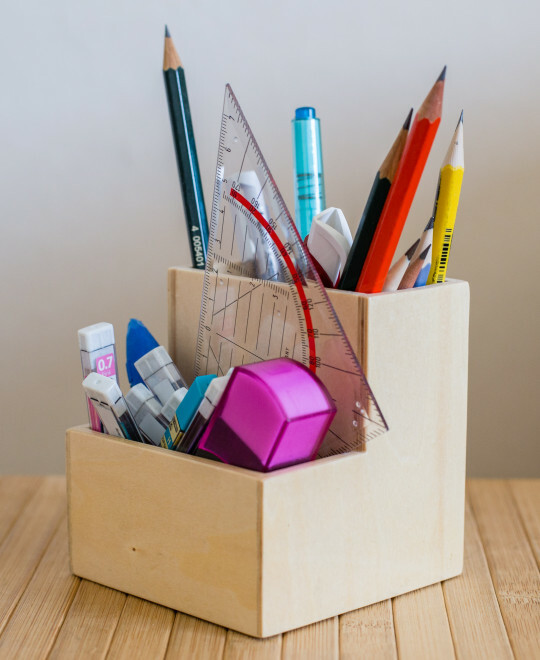 Today I want to show you some wooden pencil stands from Muji: From left to right we have the wooden desk pot (originally £4.95, currently £2.45 (~$4.05; €2.95))1, the wooden pen stand (originally £4.95, currently £2.95 (~$4.85; €3.55)) and the wooden desk rack (originally £6.95, currently £3.45 (~$5.70; €4.15)). These pencil stands have been on offer for more than a month now2. I assume Muji has reduced the price to get rid of these items in order to make space for new stock. 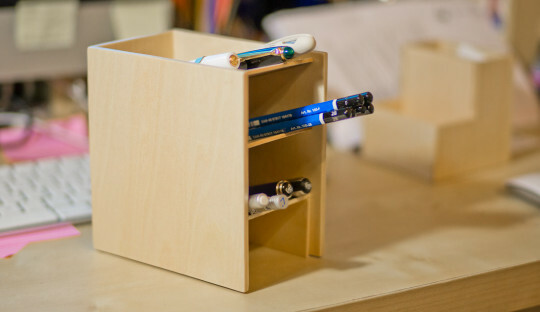 The pen stands are made from plywood in Vietnam (where Banditapple’s carnets are made). I love how they look. It’s definitely an upgrade from the common plastic pen holders. My favourite is the wooden desk rack. The top rack is great for short pens or pencils, the lower rack is great for longer pens and pencils. If you don’t want the get graphite on the desk rack it’s easy to protect the plywood at the bottom end with a small sheet of paper. If these pencil stands are not to your liking, what about these pencil stands? If this isn’t posh enough for you, what about Graf von Faber-Castell pencil holder? There’s also a double compartement / notelet holder version. As expected, there’s a hefty price tag. The full-grain leather is available in brown and black. Just in time for Black Friday: a black pen – Muji’s aluminium hexagonal flat clip mechanical pencil (0.5 mm). This pencil and other pens from the black hexagonal aluminium range were first launched in August 2010. The official price in the UK is £9.95 (~$16.20; €11.95), at the current exchange rate this is more than 60% above the price charged in Japan …but Muji has recently removed this pen from their catalogue. It will not be stocked any more from Spring/Summer 2014, which means that you can get this and other black aluminium hexagonal pens for a very good price (I paid £3 in Manchester’s Trafford Centre) in shops where they are still available. Be careful though, I have seen a few damaged pens among the black hexagonal pens on sale. The pen itself is nice and well made, especially when considering its price. I obviously realised that it has a metal body, but I didn’t realise that the body is made from aluminium until I saw “Alumi” written in Katakana on the packaging. The pencil is comfortable to hold. The weight is under 15 g1 and this mechanical pencils has a slightly bigger hexagonal barrel (8 mm) than the average wood-cased pencil (7 mm). Because of the similar shape and weight handling is similar to the Caran d’Ache 844, which features an aluminium body, too. The cap is ‘raised’ when the tip is retracted. You can even see a small gap between cap and body. The most interesting feature of this mechanical pencil for me is the retractable tip. To retract the tip of many other retractable pencils you press the top button while pressing tip and lead sleeve against the table. If you want to retract the tip of this pencil you just press the top of the clip and the tip will retract. 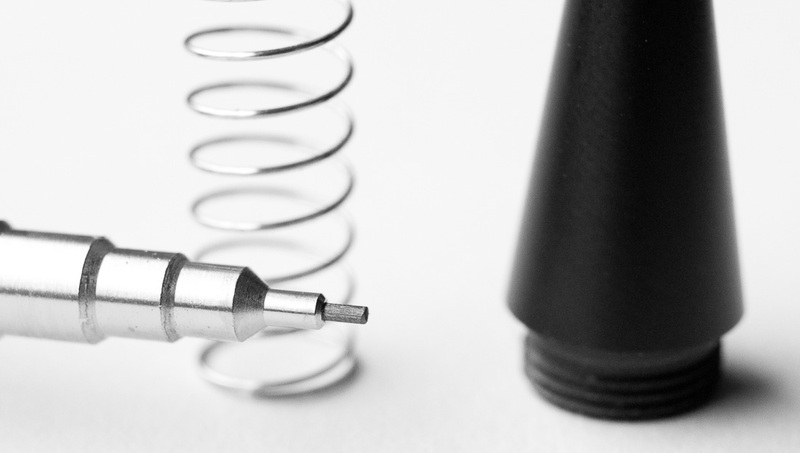 You might have seen a similar mechanism on ball point pens that retract when pressing a side button. Another thing to mention: the thin lead sleeve and the conical part of the sleeve are one unit and will both retract. 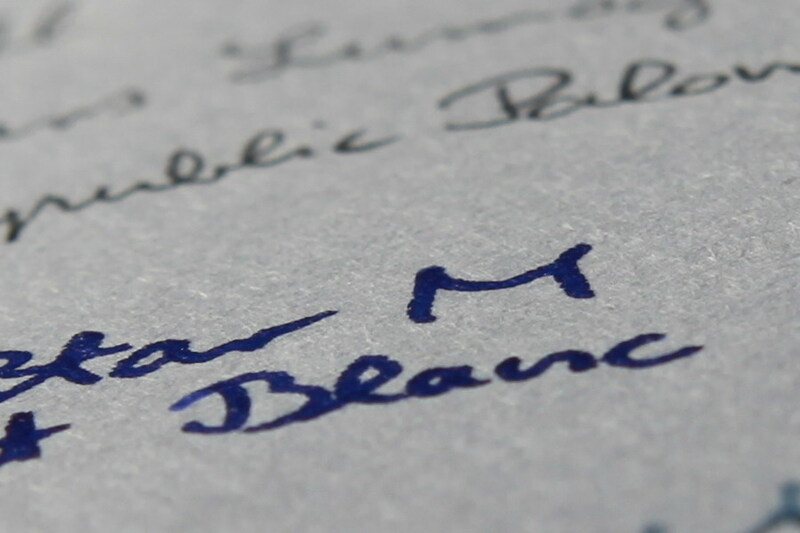 I mention this because on a Caran d’Ache 844, for example, only the thin sleeve will retract, while the conical part will not retract. The flat clip2 is, as the name indicates, flat. Unlike most clips that are parallel to the body, but leave a few millimetres gap to the body, this clip fixed very close to the body with no real gap at all. It is hinged at the top and can be opened to an angle of up to about 7°. The clip itself is made from very thin material. I haven’t had any problems, like bending, so far, but I haven’t clipped the pen often either as I didn’t want to risk bending the clip. Muji quality is usually good, but it can be hit and miss3. I’m happy to report that the overall quality of this mechanical pencil is pretty good. The inner mechanism of the pen is a bit loose. This is more common with metal body mechanical pencils, but is not really a problem. When you shake the pen you can hear it move, especially when it is in its retracted state. The sleeve/mechanism of my pen is also slightly loose, but this doesn’t cause any issues when writing. The pen also comes with an “emergency eraser” under the top button / cap. Mine came with five very smooth leads, but I think according to the Japanese on the packaging there should be six, I’m not sure though. One push will advance the lead about 0.75 mm, which is good for my style of writing4. Overall value for money is excellent, especially when paying the Japanese price or the Western discount price. 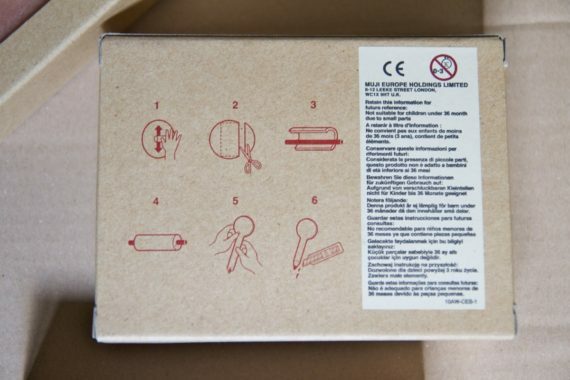 The instructions are from the packaging of Muji’s aluminium hexagonal flat clip mechanical pencil (0.5 mm). I believe that the use of the instructions shown in this blog post falls under “fair dealing” as described by the UK Copyright service. For an even closer look click on any of the photos (as usual). I’d like to thank Ms Adams-May for providing me with the dates of this pens availability. This is not the first time I mention Muji1, a Japanese retail company with stores in many countries. Their idea sounds good: No brand2 quality goods with a simple, often minimalist design. The problem is that many of their products aren’t really “quality” as promised by the brand name. I remember buying a very nice, not cheap teapot that cracked the first time we put hot water in it3. Their Memo Pads don’t work well with fountain pens and their “cotton fabric bonded cover” notebooks are a catastrophe with fountain pens. I don’t think I have ever seen paper that is less able to cope with ink. They do however have nice products, too. Their “passport” notebooks for example – and William Gibson swears by their toothpaste. A few years ago I tried it for fun, but wasn’t too excited about it. 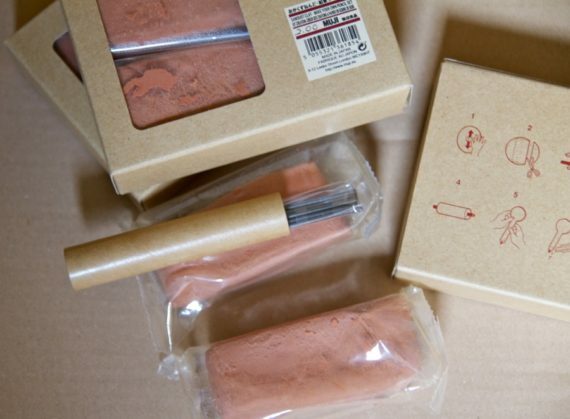 Last week I went to the Muji store in Manchester’s Trafford Centre land saw this “Sawdust clay – Make your own pencil set”. Originally £3.95 (~ $6,45; €4.50) it was on sale for £1 (~ $1.63; €1.14). I couldn’t resist and bought three of these sets. There are no instructions in text form, there are only the instructions in picture form printed on the box. Each set contains 5 lead (length 9cm, diameter ~ 2mm) and two individually wrapped bricks of wet sawdust clay (~ 65 g each). As you can see from the instructions the clay doesn’t need to be dried on an oven. I assume it will just dry out slowly, once taken out of the protective wrapping. When commenting on one of my previous blog posts Stationery Traffic suggested that I should bake a cake in the shape of a pencil – but now I’m in a situation that works the other way round: what shape should I make these pencils in? Suggestions are welcome. 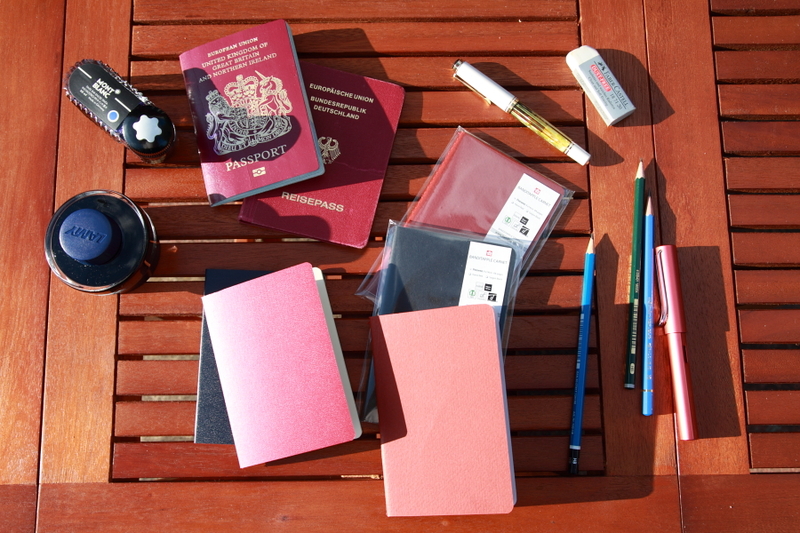 The first time I came across Banditapple carnets was when my friend Kent from Pencilog send me a few to try out. A few weeks later I received another envelope with Banditapple carnets, this time from Arnie Kim, the man behind the Banditapple carnets and an acquaintance of Kent. Kent told me that Arnie quit his job in Korea and went to Vietnam to create the perfect notebook. Vietnam was a French colony and was therefore influenced by French culture with the French-style carnet being no exception. Kent also added that Vietnam is the most suitable place in Asia to produce European-style notebooks. When I asked Arnie about his carnets he told me that he designed and planned the whole project and that he spent more than two years to find the right paper, the right “masters” to produce his carnets and the right location to make the carnets. The carnets currently available are the first edition, but he hopes to produce the second edition in a year or so. Talking about the current edition he added that the paper is acid free paper and that it works great with a fountain pens, because the ink can dry quickly and because there is no feathering. 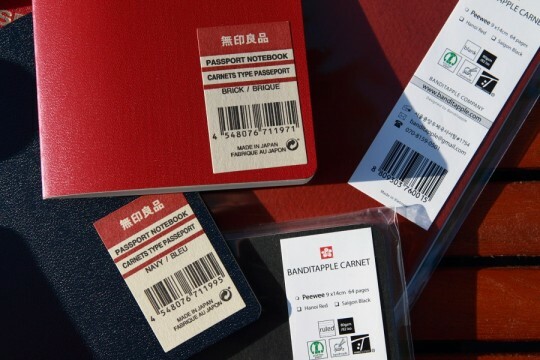 When I first looked at the Banditapple carnets my first impression was that they are very similar to Muji’s passport sized notebooks I bought in the past. 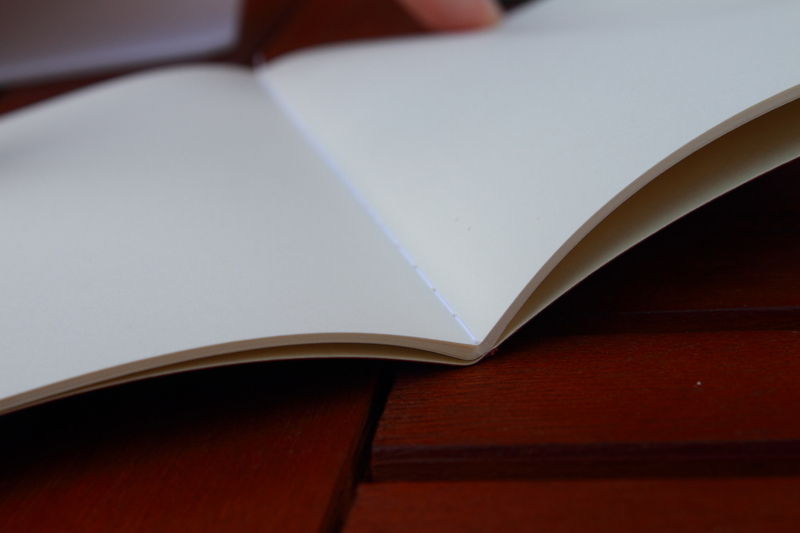 If you have used Muji notepads before or read my previous posts about Muji (about their A5 notebook and their A6 memo pad) you know that Muji products look nice and are great for pencil users, but that their paper is not particularly fountain pen friendly. I use their white lined A6 notebooks to keep QSL logs, but I only use graphite pencils (mainly mechanical pencils) for this purpose. The similarities between the Muji passport notebooks and the Banditapple carnets lend themselves to comparing them. 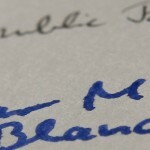 Keeping Kent’s and Arnie’s praise for their ability to cope with ink in mind (“The main partner with this notebook is actually fountain pen”) I decided to have a closer look and see how both cope with graphite and ink. 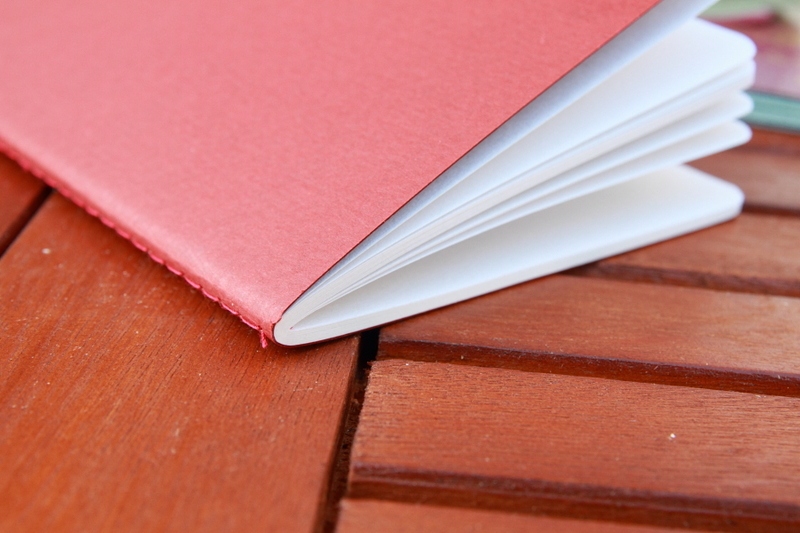 Both notebooks are sewn, not stapled, which adds a nice touch to them. While the Banditapple’s cover feels like normal, coloured paper the Muji’s cover seems to be made from impregnated paper, which will probably keep it looking new and tidy for longer. 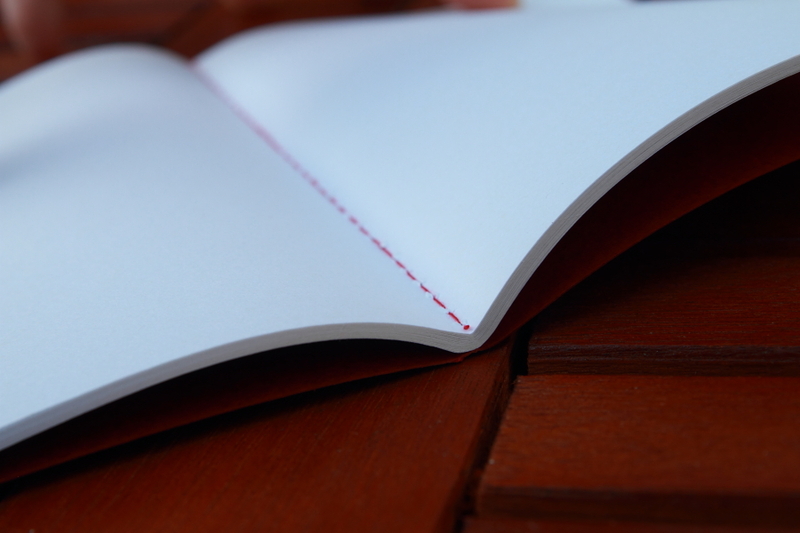 Another difference is that the Muji notebook was sewn with a white thread before the outer cover was glued on, so the seam is not visible from the outside, while the Banditapple was sewn with a red thread through the cover. The paper used in the notbook is also quite different. 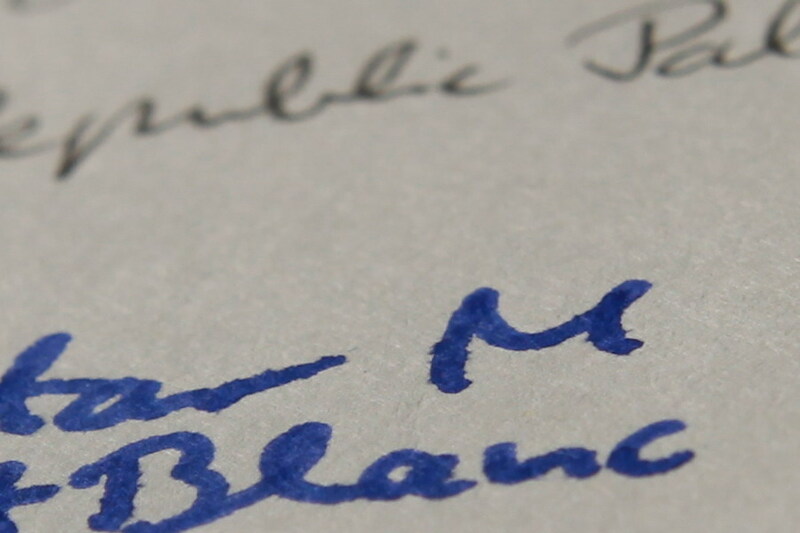 While the Banditapple’s paper looks a bit rough, Muji’s paper looks extremely smooth, nearly shiny in comparison and with a more yellowish tint. Workmanship on both notebooks is very good, but if you are looking hard you can see that the last bit of thread is hanging loose on both notebooks and that the rounded corners of both notebooks could have been cut a bit better. Click on the images to see the texture in large. 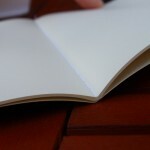 Writing text using a pencil and erasing is fine in both notebooks, but shading the paper with a pencil does not really work well in the Muji notebook. Shading works much better in the Banditapple carnet, but the rougher paper means that the paper’s texture will be a little bit more obvious than in Muji’s notebook. 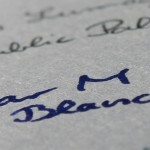 The suitability for ink was tested with two different fountain pens and inks. I used a Lamy Al-Star with an M nib, filled with Montblanc royal blue ink and a Pelikan Souverän M400 white tortoise with a 14C F nib and Lamy blue-black ink1. This M400 is usually a very wet writer, but since this ink is very dry this combination overall is dryer than the Lamy / Montblanc combination. 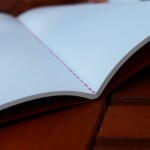 While the Banditapple carnet copes exceptionally well with both inks, the Muji notebook has some problems which result in the text being clearly visible on the back of the page. 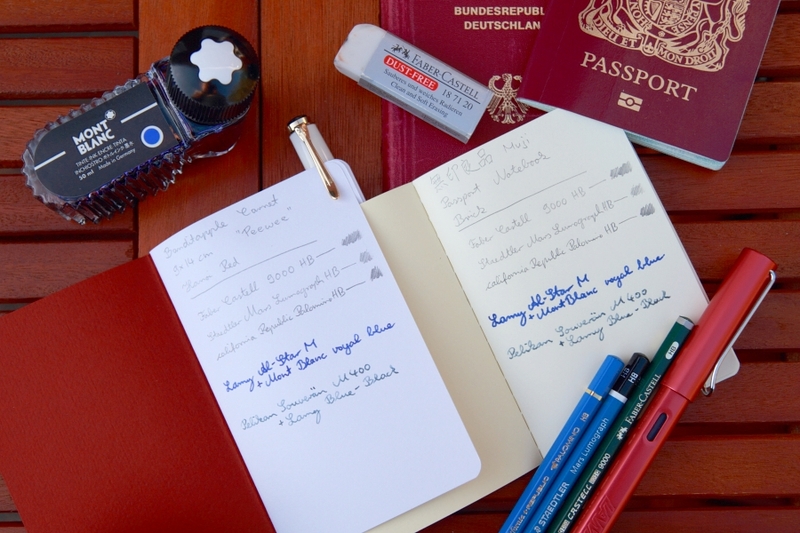 The Banditapple carnet is the clear winner in this comparison, because of the superior paper. The Muji passport notebook paper does not perform well if you use ink or if you draw with pencils. I have to emphasise that the paper of the Muji passport notebook is performing much better than the paper in Muji’s A5 notebook I have reviewed previously. 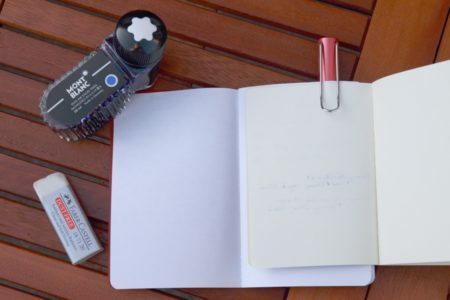 If you only write in notebooks and you only use pencils, then both will be excellent and the Muji will provide you with a cover that is more water and dirt-repelling. I would like to thank Kent and Arnie for the Banditapple carnets used in for this post.